Detroit Socialist Party member and current SPMI State Secretary-Elect Matt Erard has officially qualified for the ballot in the upcoming April 5th, 2011 election for the city of Detroit’s Downtown Citizens’ District Council, following his receipt of the Detroit Socialist Party’s nomination for that office at its February 2011 local membership meeting, and subsequent submission of the requisite number of valid signatures by the petition deadline earlier this month. Since their initial establishment in the late 1960s, Detroit’s citizens district councils have been charged with the task of representing the interests of poor and working class city residents within each district of the city where “urban renewal” development and rehabilitation projects are intended to be slated. As mandated under both state law and the Detroit City Charter, the Detroit City Council and Detroit Planning & Development Department are required to maintain continuous consultation with each applicable citizens’ district council on all aspects of the planning process for each proposed development project prior to its approval, and to incorporate all citizens’ district council recommendations to the maximum extent feasible. Likewise, Michigan state law further empowers each citizens district council with the ability to delay the implementation of any proposed project that it votes to disapprove, and to additionally call upon any city department for information it seeks to obtain on behalf of its district residents…. Each of Detroit’s citizens’ district councils is composed of twenty-four members, with six members annually elected to three year terms and the remaining six members appointed by Detroit’s mayor. The Downtown Citizens District Council represents all residents living within Detroit’s central business district, bounded by the Fisher Freeway (I-75) to the north, the Chrysler Freeway (I-375) to the East, the Detroit River to the south, and the Lodge Freeway (M-10) to the west (except for the portion of the area lying south of Michigan Ave., which additionally extends a few blocks west of the Lodge.) [district map]. Detroit’s Chrysler Elementary School Church, located at 1445 E. Lafayette St. [map], will serve as the sole polling location for Detroit’s downtown district during the city’s upcoming Citizens District Council election on Tuesday April 5th, and polls will be open from 7:00AM-8:00PM on that date for all eligible voters who have not voted by absentee ballot. Although Matt Erard is running as the Socialist Party’s nominated candidate in the April 5th Citizens’ District Council election, neither he, nor any other candidates in the race, will have a party affiliation listed with their names on the election ballot itself. Join the Socialist Party in Detroit, June 19th-26th! Leading up to the United States Social Forum converging in Detroit this June, the Socialist Party of Michigan and Detroit Socialist Party will host the Summer 2010 meeting of the Socialist Party USA National Committee, taking place on June 19th-20th at Detroit’s historic Leland hotel. Convening at 10AM on both days, the SP National Committee meeting will hold session through the early evening of Saturday the 19th, and mid-afternoon of Sunday the 20th, in the main hotel conference room (entrance through the main lobby). Members of the public who are interested in observing the meeting, or any portion thereof, are welcome to attend. The Leland hotel is located at 400 Bagley St., Detroit, MI 48226, at the intersection of Bagley St. and Cass Ave.
Thursday, June 24th, 10AM-12PM: “Building International Socialist Feminism On-Line and In the Streets“. Location: Woodward Academy, Rm. 1435 (951 E. Lafayette St., Detroit, MI 48207 [map]). Workshop Description:“This workshop will explore the purposes of and possibilities for an on-line, activist, international socialist feminist work group. As we democratic socialists move the theory and practice of internationalism into the second decade of the 21st Century, we have the potential for bringing about broader and deeper forms of global consciousness and interdependence, ones that take the principle of solidarity to new levels. The creation of an on-line, activist, international socialist feminist work group can be envisioned in this context. Coming together at the international level, on both a personal and political basis, will enable us as to confront critical global issues—such as the climate crisis, the economic meltdown, imperialist wars and occupations, erosion of civil liberties, and the deterioration of the infrastructure of our cities, towns, and regions— in a particularly concerted and cooperative way. More structured than a network, this work group would help connect socialist feminist activists through the international coordination of movement-building projects, actions, and events. Work shop participants will share their experiences with organizing at the local, national, and international level, discuss how an international socialist feminist work group could further their personal and political work, and brainstorm the processes that would get such a work group started and keep it going. Location: Wayne State University Student Center Rm. 277 (On WSU main campus – 5221 Gullen Mall, Detroit, MI 48201 [map]). Presenters: Eric Chester (1996 SP vice presidential candidate and author of Socialists and the Ballot Box: An Historical Analysis  and True Mission: Socialists and the Labor Party Question in the U.S. ), Matt Erard (Socialist Party of Michigan State Chair, National Ballot Access Coordinator for the 2008 SP presidential campaign, and regular SP candidate), more panelists TBA. Location: Woodward Academy, Rm. 1436 (951 E. Lafayette St., Detroit, MI 48207 [map]). The Socialist Party USA will also have a general literature table at Cobo Hall, (intersection of Jefferson Ave. and Washington Blvd. [map]), which is serving as the USSF’s central logistical headquarters. 9:00AM – 11:00AM: Protest Barack Obama in Ann Arbor. Meet at the corner of S. Main St. and E. Stadium Blvd. (map) just outside of the Michigan Football Stadium where Obama will be delivering the 2010 University of Michigan commencement address. Join us in demanding: An End to the Obama Administration’s further Escalation of U.S. Imperialist Aggression, Military Spending, and War! Immediate Withdrawal of all U.S. Forces from Iraq and Afghanistan! End U.S. Bombings in Pakistan & U.S. Financial Backing for Israeli Aggression in Palestine! Real Health Care Reform through the Establishment of Free Universal Medical, Mental, Dental, and Vision Coverage for All! The Establishment of a Massive Nationwide Public Works Program to Provide Meaningful and Well-Paying Work for All! The Demonstration is sponsored by the Ann Arbor Coalition Against the War and endorsed by the Socialist Party of Michigan. 10AM – 8PM: All-Day May Day Celebration in Grand Rapids. MLK Jr. Park (Fuller Ave. SE & Franklin St. E) (map). Performances throughout the day by: BMG Entertainment, Chance Jones, Euphoria, Kelly O’Brien and the Bridge Street Special, Jihad Islam, Pain and Glory, Organel Williams and the Bottom Line Band, Alexis, and Todd Krabs, more performers, as well as speakers TBA. 11AM-1PM – Community Potluck. Bring food to share or just bring an appetite. 2 p.m. to 4 p.m. “Really, Really Free Market” The goal of the really really free market is to gather a variety of people from the community to share a talent, information, something one has an abundance of, or something anyone wants to share. Hopefully some art, music, bicycle repair, moped repair, hair cuts, Yoga, Clothes, fruits and veggies. 1PM to 4PM – Stop Targeting Our Kids (STOK) will offer a range of kids activities such as face-painting, coloring, and games. The 2010 Grand Rapids May Day Celebration is Sponsored by: Grand Rapids Hip Hop Coalition, the Bloom Collective, Grand Rapids Institute for Information Democracy, League of Revolutionaries for a New America, Workers Solidarity Alliance, Lansing Workers Center, Black Autonomy Network Community Organization, Grand Rapids IWW, US Social Forum, Stop Targeting Our Kids, Our Kitchen Table, and the Socialist Party of Michigan. 12PM – 3PM: Fifth Grand Peaceful March for Immigration Reform – Detroit. Gather at Noon at Patton Park (W. Vernor Hwy. & Woodmere St., southwest Detroit, MI). March 3 Miles down Vernor Hwy. to Clark Park (W. Vernor Hwy and Clark St.) for 2pm rally. (map). Join us in demanding: An End to the Raids & Deportations! Immediate Legalization for All! Close Inhumane Immigrant Detention Centers! Pass the Dream Act! End Home Foreclosures, Evictions, & Utility Shutoffs! Pass Michigan Senate Bill No. 29 (Two Year Home Foreclosure Moratorium)! 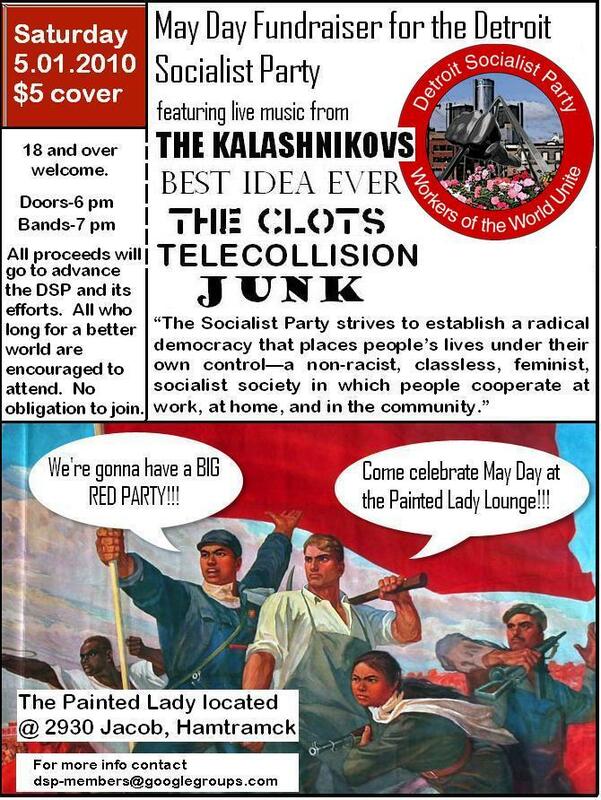 6PM – 12AM: Detroit Socialist Party Benefit Show Featuring musical performances by The Kalashnikovs, Best Idea Ever, The Clots, Telecollision, and Junk– at the Painted Lady Lounge, 2930 Jacob St. Hamtramck, MI 48212 (map). $5 cover (goes to support the Detroit Socialist Party). (18+ age-limit due to bar location). Beginning January 17th, the Detroit Socialist Party will be hosting free Sunday night film screenings each month at the Painted Lady Lounge in Hamtramck. The Painted Lady Lounge is located at: 2930 Jacob St. Hamtramck, MI. 48212. A map and driving directions can be found here. Admission to the DSP movie nights is free, however, there is an 18+ age-limit due to the bar location. Note: Check the Meetings & Events Menu in the Right Column of this Site for Info on Upcoming DSP Movie Screenings Each Month! Following nearly a half decade since Detroit last had an organized Socialist Party local, the Socialist Party of Michigan has re-chartered the Detroit Socialist Party, with jurisdiction covering the entirety of Wayne, Macomb, and Oakland counties. With respect to the particularly key role the Detroit Socialist Party played in the formation and development of the United Auto Workers up through the early 1940s, the directly following emergence of today’s prevailing ‘business unionism’ model was largely personified by Walter Reuther’s concurrent break from the Detroit Socialist Party. Even as late as 2004, the Detroit Socialist Party was among the most conspicuous organizations challenging the attempted privatization of the Highland Park Water Department, on which the 2007 documentary film The Water Front focuses.